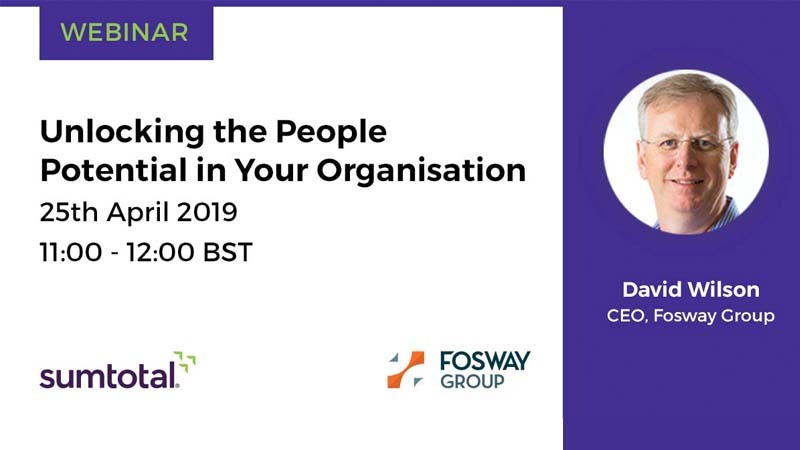 Ahead of his webinar with us later this month, David Wilson, CEO of Fosway Group, Europe’s #1 HR industry analyst, joins us to share his thoughts on the importance of talent and people development today. This captures the experience of many of us at both an individual and an organisational level. A sense of technology and work moving faster and faster; being impacted by advances in technology, how we work and who we work with as well, whilst changes in demographics mean we now have a much more diverse workforce. From our research, here is just a snapshot of the serious change impacting organisations like yours. Nearly half of our research respondents confirmed that an aging workforce is a growing trend in their organisation and 45% highlighted that their teams are becoming increasingly diverse. When this is combined with the increasing speed and impact of technology, organisational success and agility becomes not just about harnessing the energies of newer entrants to work, but also about maximising those with more mature careers. But when asked if their systems area a good fit for the modern workforce, the resounding answer is NO! Nearly 70% of organisations from our latest research in association with SumTotal, the findings of which we will release in the coming weeks, say their systems are not fit for the modern workforce. And when we look more closely at talent management, only 9% believe their solutions fully meet expectations. Without wishing to understate this, there appears to be a crisis in talent management today. 91% of organisations are not able to deliver the sort of experience that enables them to attract and retain the best people in the modern economy. And with 47% of organisations declaring they either have no systems in place or just use Excel spreadsheets, the scale of the under-investment in people becomes abundantly clear. But the opportunities are immense. What consistently stands out from this, and Fosway’s ongoing research, is the importance placed on individual growth and learning. Whether it is in the priorities for improvement in the organisation’s Employee Value Proposition (EVP) or the biggest differentiator of an organisation’s EVP to their existing and prospective talent – learning consistently tops the bill. As you can see here, the word cloud built from the free text responses to the survey question ‘What part of your talent and people development approach do your employees value the most’ tells the story perfectly. And against a consistent message from business leaders themselves – there is no reason not to act. The writing is on the wall with a skills crisis looming. There are simply not enough people with the right skills available. So, what is clear is that you need to grow and develop those people yourself if your organisation is to keep pace with the speed of modern business. And the great part is that investing in that proposition actually creates a virtuous circle in your organisation, because the opportunity to learn and develop is the #1 reason people want to join your organisation – or leave it if those opportunities are not available. But in a world where successful organisations need to attract, stimulate and keep employees who love to learn. What a great coincidence that that is the reason why the best talent wants to join your organisation. Talent is attracted to those who develop and grow the careers of its people. Which means there has never been a better time to invest in your people development story. Not only will it help you bridge the skills gaps, and help you retain your talent, it will also help you attract the best too… And with the bar sadly set so low, as our research shows, it’s easier than you might have thought to a leader in talent today – and unlock the people potential of your organisation for tomorrow. I’ll be hosting a webinar in association with SumTotal Systems which explores ‘Unlocking the People Potential in your Organisation’. Register today. You can follow David via @dwil23 and Fosway on @fosway for more insight and analysis on HR, talent and learning.